Barack Obama can package it anyway he likes. After sabotaging his own - glaringly transparent - “bilateral talks” approach, he can table “another” peace plan; he can call it “new.” He can build it on what American administration officials reportedly see as “past progress achieved” in the peace plans littering the last two decades of history. He can draft it in close conjunction with Israeli traitor Rahm Emanuel and Jewish turncoat Dennis Ross. He can credit – or, if it fails, blame it on – his special board of present and former national security advisors. No matter what his “new approach,” the truth is that from Madrid to Annapolis, from Oslo to the Road Map, there has all along only been one peace process, one peace formula, one peace plan. And the version Obama’s White House floated via David Ignatius in The Washington Post this past week changes nothing. Well, there is one little difference, or perhaps not such a little one. This president is stooping to a low reminiscent of the 1991 “linkage” ploy played by Secretary of State James Baker, who tied the granting of loan guarantees desperately needed by Israel for the absorption of a million immigrants from the former USSR, to Jerusalem’s agreeing to participate in the International Middle East Peace Conference in Madrid. 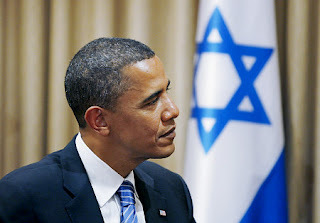 Now, aware of Israel’s enormous concerns about the danger of an Iranian atomic bomb – and nothing troubles Israel today as much as this threat – Obama’s line of attack is to link America’s support against Iran to Israel’s compliance with the White House’s demands on the peace process. But let’s not be sidetracked by even this below-the-belt attack. What’s absolutely vital is that we keep focus sharply on the essence of the issue: the same old, unaltered plan, now assuredly – despite protestations of denial from Washington – being prepared for presentation as a new one. Like all the other versions, it will be doomed to fail. For at the very base of its foundation festers the wrong and immoral notion – to mollify Arab-Muslim aggression and warmongering by feeding it pieces of Jewish land. Such reasoning may placate the indignation of some, but it cannot and does not expunge the immorality and wickedness of the peace plan known as the Berlin Diktat. How much more repulsive is prosperous America’s readiness to sell Israel down the river rather than face down Arab threats of oil price hikes and boycotts. Smelling Jewish blood, the leaders of Jordan, Lebanon and Turkey this week denounced Israel as the main threat to peace in the Middle East, and called on President Obama to force the Israeli government to negotiate. Not just in the Middle East, but around the world, when it comes to apportioning blame for the never-ending Arab-Israeli conflict, there’s a lot of finger pointing going on. Almost all are pointing at Israel. Not mine. More than anyone responsible for perpetuating this conflict, I accuse officials in the current and previous governments of the United States. These include presidents Barack Obama, George W. Bush, Bill Clinton, George H.W. Bush, Ronald Reagan and Jimmy Carter. With them are current and former national security advisors, Jim Jones, Brent Scowcroft, Zbigniew Brzezinski, Sandy Berger, Colin Powell, Frank Carlucci and Robert C. McFarlane. Also in the dock are secretaries of state Hillary Clinton, Condoleezza Rice, Madeleine Albright, Warren Christopher, Lawrence Eagleburger, James Baker, George Schultz, Alexander Haig, Cyrus Vance and Henry Kissinger. When it comes to their behavior towards Israel, all have this in common: They have been, and are, bullies and cowards. They are bullies because they have been willing to brandish the massive size and influence of the United States over the head of little Israel; trying to coerce Israel into acceding to Arab demands. And, like all bullies, they are cowards; too yellow-livered to identify, denounce and reject the Arab and Islamic world and declare their strong and biased support for the Jewish state that looks to them – albeit in vain – as friend and ally. As long as American foreign policy in the Middle East is designed and implemented by immoral politicians it will fail. Only a plan predicated on truth and justice can – and will – bring peace.